Color:Kitchen Garden Print Color:Kitchen Garden Print Looking for a safer and more efficient way to keep your food fresh?When it comes to storing food and preserving its quality, you’ve probably first thought of wrapping it in plastic or putting it in a plastic container. That’s not surprising. Given how much convenient it is to use plastic, most kitchen owners won’t easily find a better alternative.Plastic is bad for you and the environment. This is not news. You’ve probably seen all the plastic waste that ends up in the marine ecosystem or the infamous plastic island thrice as big as France. Phthalates (compounds usually found in plastics) can also leech into your food bearing harmful effects on your family’s health.Lux Spoon Premium Beeswax Food Wrap provides a safer and more sustainable way to keep your food fresh!Whether it’s for produce, sandwiches, or leftover food, our organic beeswax food wrap is your best solution to keep them all fresh and ready for consumption. Our wraps are made from organic cotton, premium beeswax, jojoba oil, and tree resin that will effectively seal your food to prevent moisture and external contaminants from ruining it.Our wraps can efficiently cover any container or bowl once you mold the sheets by the warmth of your hands. This will ensure a compact and long-lasting seal. Once you’re done using the wraps, wash them with cold water and dry them for your next use. 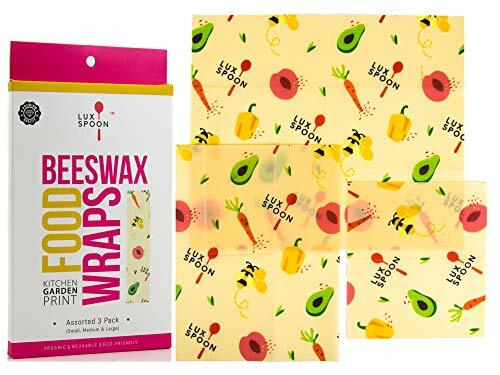 Unlike plastic that will last up to hundreds of years before decomposing, Lux Spoon Beeswax Food Wraps are conveniently biodegradable and compostable.Here’s few more boxes to check:✅ Comes in various sets and sizes for your different food storage needs.✅ The new better adhesion formula efficiently sticks to food containers.✅ Easy to clean and dryYou can now store your food better. Add Lux Spoon Wraps to your Cart NOW!